During the last days of December, a lot of bloggers were looking back, reflecting on the events and trends of 2012. It looked like fun, but I was still consumed by the holidays and the related hubbub. Now that life has calmed down a little, I thought I'd look back at my favorite 2012 fashion trends. As a woman over 50, I don't feel desperate to replicate what's in vogue at the moment. I'm so past being a slave to fashion--like by 40 years! Instead, I wear what I like--what flatters my body shape and makes me feel good. That said, I do like to incorporate bits and pieces from the current trends. The trends help breathe new life into my over 50 look. I get tired of wearing the same clothing styled the same way. Naturally, I pick and choose what trends to follow. Last spring's bare middriff look wasn't under consideration, for example. Instead, my over 50 style is more about giving a subtle nod to the trends. Take, for instance, the 2012 emphasis on bright colors--red, orange, yellow, purple. Last spring, I counted three trench coats, each a slightly different shade of beige, in my coat closet. 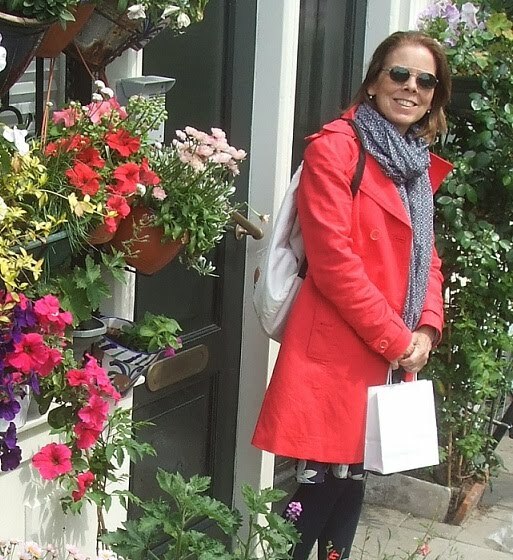 In April I just couldn't face them and bought a bright colored trench (above). It gave me a whole new attitude about those April showers. Click "Read More" below to see my other favorite 2012 trends and leave me a comment with yours. Thanks. Is wearing black and blue a revolutionary concept? Hardly. But I had forgotten how much I love the combination until I saw it everywhere--in the magazines and on the street--in 2012. I'm a New Yorker, so needless to say I've got a ton of black in my closet. And royal blue, like the sweater above, is another one of my flattering colors. 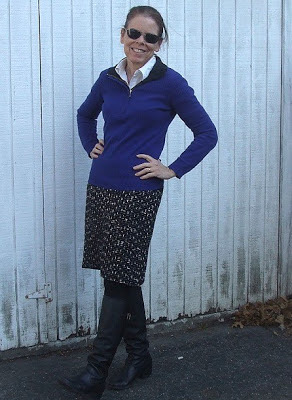 The black and navy blue look (scroll down to fun skirts for an example) is a little more edgy--which is exactly where this over 50 woman likes to be. I love the 2012 "mixing things up" trend for two reasons--1) it gives me a sense of freedom, no or few rules, and 2) it offers an opportunity to create more "looks" with what I've got. I do not have an unlimited clothing allowance--hardly--and mixing colors, prints and textures has given me lots of new outfits. In 2012, I kept my mixing of prints very low key. The one rule I follow: Wear prints with a common color theme. 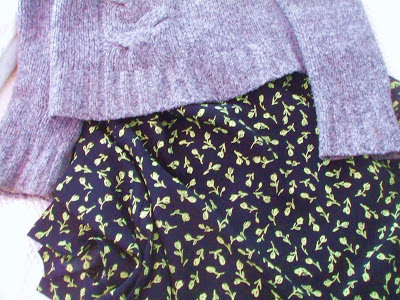 It may be hard to see, but the blouse and skirt (above) share an olive color. Perhaps, in 2013, I'll be more adventurous. I've also embraced the texture mixing trend. 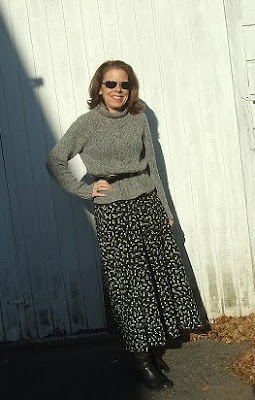 I absolutely love wearing a chunky sweater with a light-weight, flowing skirt (above). 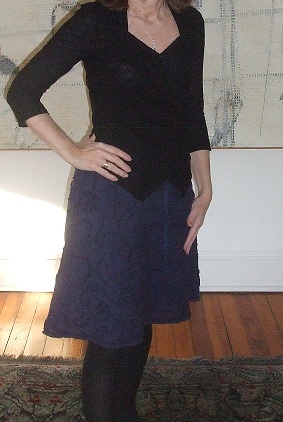 (By the by, I also wore a lot more long skirts in 2012.) And I like wearing a skirt with a solid-colored sweater in a color that doesn't exactly match the skirt. If the skirt has a light color (lime green), I'll pick a light-color sweater (smoky grey). Oh, yes--I also latched on to the belt it trend in 2012. The boxy, baggy look rarely does us over 50 gals any favors. Of the 2012 trends mentioned, the dresses and skirts over skinny jeans or slacks may have been the most liberating one for me. It solved my lifelong "heavy thighs" issue. Last February, I saw dresses, skirts and long tunics over skinny slacks among the 2012 fall collections. Instantly, I thought: that's for me!! First, I bought a couple of pairs of skinny jeans at Old Navy. When I'm trying out a new trend, I often buy low-price versions to make sure I really like the trend. (I was raised by thrifty New Englanders!) The Old Navy stretch jeans are super cheap, super comfortable and have held up after a ton of washings. 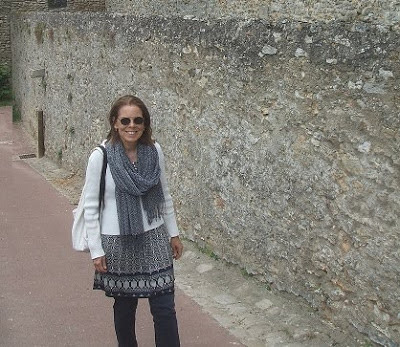 The dress/skirt over pants is a great outfit for traveling. The photo above was taken on vacation in France last spring. I brought 3 jersey dresses that I wore over skinny jeans or with tights--for variety. I admit it: I own a lot of skirts. The crazy thing, though, is the vast majority of my skirts are work skirts. I've got oodles of pencil skirts, for instance--not exactly a weekend look. So when I saw all of Prada's really cool skirts last spring and at the Metropolitan Museum of Art exhibit last summer, I got inspired. I started hunting around for fun skirts. 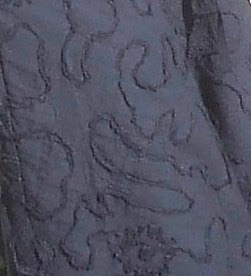 I love the scroll stitching of this skirt. Since, it's navy, I wore it a lot with black tops in 2012. And...I was absolutely thrilled by all the tops and dresses with three-quarter sleeves in 2012. I hope the clothing makers keep them coming! I can't wait to see which trends I will experiment with in 2013. Right now, vintage designer shoes and handbags are at the top of my list. I'm just not crazy about current shoe styles and think I'd have better luck with vintage. Also, I've been toying with the idea of adding more tops with faux fur or leather trim. I also love the slimming effect of the monochromatic look. And since I'm a skirt geek, I'll be hunting for more fun skirts. What's your fashion forecast for 2013?